Rock climbing is one of our most popular activities, and we offer courses and holidays in a variety of spectacular settings in the UK and abroad throughout the year. The majority of our courses are located within the Lake District, but between autumn and spring we escape the cold to the Sun Rock of the Mediterranean (including El Chorro, Mallorca, Sardinia, Costa Blanca, Corsica). We also offer weekend breaks to other top quality climbing venues in the UK, including the Peak District, North Wales and Cornwall. In the Lake District, favourite climbing haunts include Borrowdale, Great Gable, The Langdale Pikes, the Eden Valley and St Bees Head. We cover a wide spectra of difficulty from beginner to expert, so whether it is your first time or one of many, we can cater to your particular needs or desires. Our clients range from young to old and from low to high fitness, and neither age or physical condition are barriers to an enjoyable holiday with Go Higher. We have found that the most important factor in you achieving your goals is self-confidence, which we believe we can enhance. We will teach you to relax on rock by gaining confidence in the equipment and belaying system, in a friendly environment. 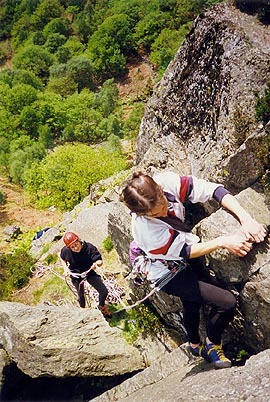 You will then be encouraged to climb and abseil on easy slabs until you are sure of your footwork, before moving onto a variety of crags and climbs. You will learn basic climbing and rope handling skills; how to choose sound anchors and set up safe belays; stance management; the placing and recovery of modern protection; interpretation of guidebooks and route selection. We aim to improve your climbing techniques and your understanding of the belaying system. After revising basic skills you will have the opportunity to practice safe leading on single and multi-pitch climbs, using single and double-rope methods. We will also practice some self-rescue techniques, and of course, enjoy some rather more exhilarating routes in stunning surroundings. Simply relax and enjoy the climbing as we lead you up some of the finest routes the Lake District has to offer, whether in the valleys or on the high mountain crags. With our intimate local knowledge we know the right crags for the weather conditions and can assure an enjoyable and worthwhile day. local transport to and from the crags. Remember that conditions can change rapidly in the hills, so always be prepared! It is often worth bringing along a spare set of clothing to change into at the end of the day in the event that conditions do worsen. Below are the scheduled courses and holidays for this activity. For the full list of activities, courses and holidays please refer to the Tariff and Calendar. If you'd like to know more about this activity and/or Go Higher and our our services, please feel free to contact us. Would you like to join us? Then fill in our booking form. Imogen powering through on "Wall and Corner", Duddon Valley, Lake District. Photo © Steve Morgan, Go Higher. 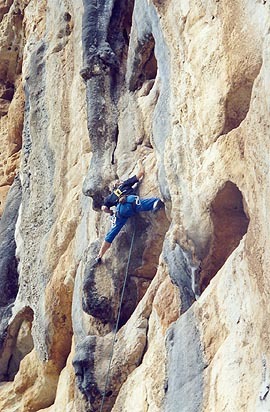 Bridging up an El Chorro classic, Spain. Photo © Steve Morgan, Go Higher. [Inset Photo]: Roger enjoying the Sun Rock of Mallorca. Photo © Go Higher.